Soft tee with high quality print ! EMS Heavyweight Long Sleeve Pocket Tshirt Size XL. Condition is New with tags. DOWNSIZING MY NUMEROUS COLLECTIONS. Please feel free to contact me with any questions. Top to Bottom 33” Armpit to Armpit 24” Armpit to Bottom 22” Shipped with USPS First Class Package.
'' EMS'' MENS T-SHIRT. A ROAD LESS PADDLED SIZE XLARGE. IT'S 90%COTTON 10%POLYESTER PRE-SHRUNK. THE BACK IS PLAIN. THE T-SHIRT IS GRAY AND THE ARTWORK IS LIGHT AND DARK BLUE. THE LEFT SLEEVE HAS THE LETTERS EMS ON IT. This black T-shirt from Rothco has “EMT” in white letters across the chest. Pit to Pit 21 " Back Collar to Hem 30 ". Pit to Pit 21 " Back Collar to Hem 28 ". 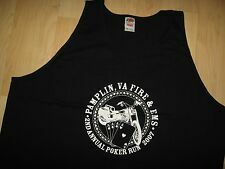 Design: The front chest design reads: "Pamplin, VA Fire & EMS. 2nd Annual Poker Run. A Great Collectible Tank Top From Trader Yore. Extras: A Great Looking / Collectible Tank Top ! EMS Beyond The Call Of Duty t shirt. This 100% cotton black short sleeve t shirt is in great condition. This 100% cotton black short sleeve t shirt is in great condition. Semper Paratus (Always Ready). This 100% cotton black short sleeve t shirt is in great condition.